The Lanier MP CW2200 combines full-color output with exceptional versatility to meet a wider range of wide format workflow demands. The affordable, full-color low-volume digital imaging system offers print, copy and scan functionality to ensure essential large documents can be captured, saved and shared with incredible ease and simplicity. Present design plans, documents, schematics and more in brilliant colors — exactly the way they were designed. Offers incredible multifunction performance, including copying, scanning and printing, to streamline low-volume, wide format workloads for CAD-centric organizations, such as architectural, construction and engineering firms. Choose from multiple paper sizes and weights in order to meet every demand and manage every project with ease from the device or from the desktop. Take advantage of embedded SDK architecture to integrate highly productive Lanier applications such as GlobalScan NX. Take advantage of the 4.3″ tiltable operator panel to configure workflows and to set up easy, one-touch shortcuts for frequently used tasks and personal preferences. A simplified display and step-by-step animated guide ensure easy operation for every user. Users can also replace proprietary ink cartridges in moments without swapping print heads for longer-lasting performance and less waste. Share high-quality color or black-and-white electronic documents quickly and easily at no additional cost. The Lanier MP CW2200 lets you scan full-color originals and distribute them via Scan-to-Email/Folder/FTP/HDD. Take advantage of Scan-to-URL to give users in the field immediate access via any Web browser. Save files directly to a USB or SD card for mobile convenience. In addition, full-color thumbnail views allow users to review documents for accuracy and clarity before delivery. 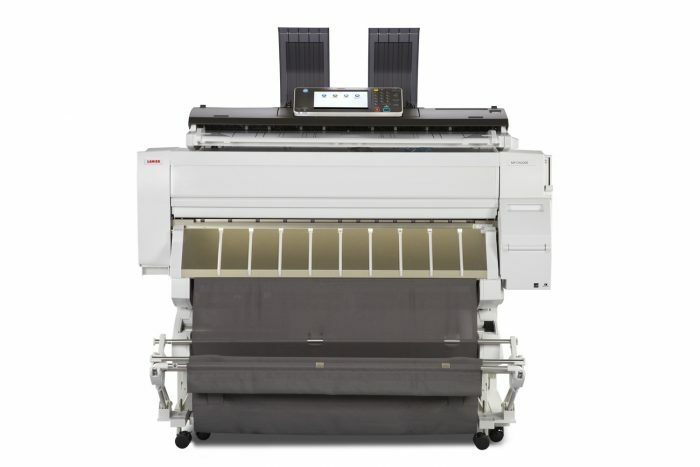 The Lanier MP CW2200 includes multiple paper feeds to ensure users have the right kind of paper to handle every project with consistent speed and efficiency. With optional two-roll printing, the system can accommodate various-sized paper rolls and change them automatically. Users can print on the appropriately sized paper to reduce paper waste without having to walk to the device and spend critical time changing paper manually. With user authentication, print jobs are stored and released only when the authorized user swipes an ID card or enters a password at the device. PDF encryption protects the integrity of scanned, password-protected PDFs during distribution. The device includes the DataOverwriteSecurity System (DOSS) feature to automatically destroy latent images and data on the HDD. Administrators can even restrict access to specific functions for each individual user. With the built-in USB and SD card slots, users can Scan-To or generate prints directly at the device using a USB memory or SD card for optimal on-the-go flexibility. The Lanier MP CW2200 supports an optional keyboard unit for users who prefer traditional keyboard input to a touch screen. In addition, users can even print from most manufacturer’s mobile devices to ensure they have important documents at the most critical times.